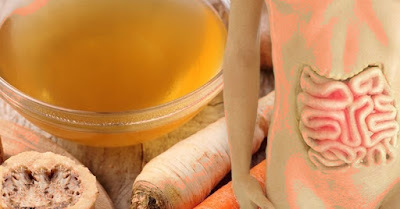 Bone broth is one of the most effective tools for relieving joint pain. Some bone broths contain glycosaminoglycans like glucosamine, chondroitin sulfate and hyaluronic acid, which promote collagen formation and healthy cartilage. Bone broth also supplies the body with amino acids needed for building connective tissue and healing injuries. Eating nutrients which support collagen synthesis can also help stimulate bone healing from bone loss and bone fractures. When the gut barrier doesn’t function properly, the compromised immune and digestive system affect the entire body and lead to digestive distress and autoimmune disease. The changes in immune activity at the level of the gut are believed to be the trigger of systemic inflammation seen in multiple sclerosis, arthritis, thyroid disease, celiac disease, and lupus. The role of bone broth in these conditions works at the level of improving the gut lining`s health. The gelatin-dense broth is a robust nutritional source of nutrients which strengthen the delicate villi that pave the intestinal lining. There is emerging evidence suggesting that gelatin helps heal the intestinal gut barrier damage which is common in IBD, IBS, and celiac disease. Glutamine found in bone broth plays a significant role in looking after the gut lining. It boosts immunity and stimulates scar tissue healing. Various studies have found that it supports the growth of villi wguch are damaged among people with intestinal bacterial overgrowth and celiac disease. Additionally, glycine, acts as potent anti-inflammatory agent which has been found to protect the intestinal lining from bacterial invaders during sepsis. Although bone broth is not a cure-all and isn’t going to raise the dead as the South American proverb says, there is solid amount of scientific evidence to suggest that incorporating its nutrients in your daily diet may have an important role in healing gut damage. Two or three cups of bone broth daily may be a potent addition to your diet to reduce inflammation and promote gut healing. It is highly versatile too, so adding this nutritious food to your diet is quite easy. Using it in soups, stews or casseroles is a good way to benefit from its and its robust nutritional profile.